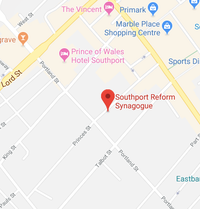 The synagogue office is open Wednesdays and Fridays 10am-3pm. At other times there is an answer phone with emergency contact numbers. Please avoid phoning ,if possible, Saturday and Festivals. We have facilities for the disabled and deaf. We are located adjoining the Portland Spa, at the corner of Princes Street and Portland Street. Shabbat morning services start at 11 a.m. and usually last for about one and a half hours after which there is a Kiddush and an informal get-together. Services are held in a rather less formal atmosphere and children, no matter how young, are made very welcome, as are all age groups. All services are read in Hebrew and English. Equality between men and women in the Synagogue and at services is taken for granted and women are called to the Torah and given other honours equally with men.�As a constituent Synagogue of the Movement for Reform Judaism, women play their full part with men as members in their own right and are able to be voted onto Executive and Council of the congregation. � �� Please look through our site and find out more ....click Membership, News�and events….